On March 13, 2010, we adopted one of your dogs. Her names was Sparkles and she was a mini schnauzer who was rescued from a puppy mill. We changed her name to Muffin. It is with heavy heart to inform you that Muffin has pasted. She developed cancer in her intestines and her liver. Muffin passed in January 30th between 10 and 11 pm. We have enjoyed the years we had with her. She became my shadow and needed to know where I was in the house at all times. She slept on the floor on her pillow next to me every night. When she got excited she would do this little tap dance and wag her little knobby tail. She and my other dog also enjoyed going on family vacations together. She was a great little companion. She is going to be missed greatly. I just wanted to thank you for letting us adopt her which brought joy into our family. Good luck with your future adoptions. 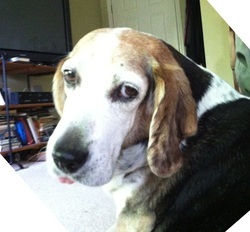 We sadly learned of the passing of one of our sweet former Rawhide Rescue alumni, Angel. 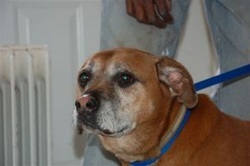 Angel was an English Mastiff that was owner surrendered to us in February 2011 when she was 7 years old and her past was such a sad story, and we knew it our mission to find her a new home. This gentle, beautiful girl was was immediately fostered by one of our volunteers, Sonal, who warmly welcomed her into their home. But it wasn’t long after that Angel was there, that Sonal and her family realized that they couldn’t let her go and she became a beloved and cherished part of their family and spent the last 7 years receiving and giving so much love. RIP sweet lady, June 8, 2004 – August 29, 2018. Thank you Sonal, Marc, Lindsey and Sophia for opening your hearts and home to this wonderful girl. It is with a heavy heart that I am giving you the news that Missy, the Llewellyn setter that my wife and I adopted from your fine organization back in 2003 has passed away. We first saw her, advertised as a Welsh Springer, at one of your foster homes in Dunellen. The actual breed didn’t matter; once we saw her, she was ours.She provided me and my wife with an unending source of companionship.Additionally, she devised herself various “jobs”, the most prominent one being our morning “alarm clock” and our “time for bed” clock. She survived having a cancerous growth removed six or so years ago. Dr. Coleman and his staff at Meyersville Veterinary Group looked after her health during her time with us, providing some of the finest care we have ever received in all of the years that we have had pets. Missy was much more than just a pet and I can never say that we owned her; I more think that she owned us. The Rainbow Bridge is a real tear jerker but Diane and I both hope that when our time comes, the author knew what he or she was talking about. Our days with dogs is not yet over. As Spring approaches, we will begin the search for another one who needs to look after us; Missy has left big paw prints to fill. In 2013 she was having her teeth cleaned and after a routine cardiac test, they found out Foxy had a leaky heart valve and so began our fight against chronic heart disease (Mitral Valve Disease). Foxy was put on several medicines and had routine echo tests to make sure we were keeping up with her heart that kept getting larger. The past few months were a rollercoaster for us and I swear she had nine lives. What a fighter she was with her heart disease. After adjusting her medicines, she was doing well and then wasn't. Everyone kept telling me you'll know when it's time. Well, Foxy looked at me and I knew. I took her to the vet to say goodbye and told her what a great dog she was and how she was going to feel better and how much I loved her. I told her to look for her cousin Pepper-oni when she got to heaven. Thank you Rawhide Rescue for connecting me with my first dog. She had a positive impact on everyone she met. Foxy was one in a million and I was lucky enough to be a part of her life. 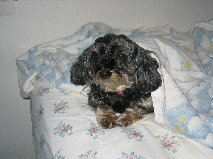 We were not seriously looking for a dog when, in February 2007, we were told of one being fostered for Rawhide Rescue that we might like - a 9 year old YorkiePoo in need of a home, by the name of Tricksie. 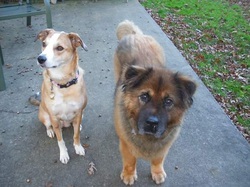 Her family had outgrown their interest in having a pet and she had been surrendered. 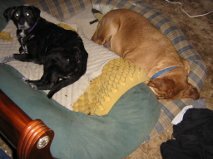 We wondered whether we would like an older dog, especially one who had lost weight and looked like a "sad sack" when she came to our home. But she needed us and we soon found out how lucky we were. Tricksie quickly got her appetite and spirit back and was the best dog that we could imagine. We loved walking her and enjoying each others company, including having her join us in bed (as shown in the picture) and sleeping on her down pillow. She was there for us when we suffered some tragic family losses. When she could no longer safely jump, we got her stairs for her to scamper up into bed. We couldn't resist the occasional table scraps - a "no-no" - but which also meant that she joined us at mealtime. When we returned from being out she would race around the house with joy at seeing us and yowl with happiness. Tricksie was a cherished friend that we were blessed to have for over 8 years. May she rest in peace and one day be waiting for us at Rainbow Bridge. Emma was a puppy mill breeder that Ingela took under her wing about eight years ago. Ingela asked me to foster Emma and I refused -- Emma barely moved, just drooled with no expression on her face and no life in her eyes. I never saw a dog I wanted to foster less. But, being Ingela, she finally convinced me to take Emma. I took her into my home where she continued to drool, refused to walk, play or even look me in the eye, No one ever inquired about adopting Emma. But, after a few months, Emma began to come out of her shell. The spark that only Ingela could see emerged over a period of years. After seven years of love and joy, Emma slipped away from me, in my arms, at home, of her own volition (as she did everything). I will always love and remember both Ingela and Emma, the love of my life. - Karen. 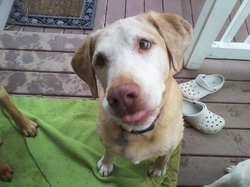 Woody, who was known to you as Buddy, a yellow lab mixed with, maybe, Vizsla , Weimaraner, and/or Ridgeback, and a big dose of crazy as well. We adopted him sometime in early 2002, and we figured he was about a year old at the time. He died on Saturday. He was his goofy self at 10:30 a.m. and gone at 11 a.m. He just sort of lay down and died, with no noise or anything. A nice way to go for him, pretty tough on us. The vet speculated a heart arrhythmia or an undiagnosed tumor that burst. We managed to get him through puppy school. He flunked the first time, but when he went back, he was way ahead of everybody else and took great pride in showing all the new kids what was expected. He was very good at sitting and staying, and he usually came when you called, but sometimes he would just run off. The longest he was gone was about 75 minutes, and we were on tenterhooks. Woody was one of the sweetest dogs that ever lived. We decided that he would have been better off if he knew how strong he was and that he could bite if he had to. But he was always anxious, and for the first couple of years he would quake in fear frequently. Apparently, you rescued him from the Staten Island pound, where he was one day from euthanasia because, even though he was very beautiful, he just cowered in the back of his cage and shook and drooled. But when we ran into him at the adoption day at the pet shop on the Summerville Circle, he had figured out how to attract the crowd. Everybody seemed to want Woody, and Kathy was worried you would give him to this guy who kept going around telling everybody he was a physician. As Woody aged, he became more comfortable in his skin. We decided his previous family was probably very caring toward him but just couldn’t put up with his anxiety in that urban environment. He was happier out here in the country. Woody loved to go in the car. He was crazy to go in the car. He learned that “ready” often meant we were getting ready to go out, and whenever he heard that word, as he did Saturday morning, he would jump up and frequently start whining, even if we were only talking about getting ready to watch a TV show. We miss him a lot. We’ll bury his ashes out in the special place in the garden with Jake the Dog and Abby the Cat, both of whom died years ago. Stephanie was found as a stray four years ago. She was a lovely lady who never showed her age. Sadly she developed health issues and crossed over the Rainbow Bridge on Thursday. I'm sure her last years were the best any dog could dream about. Thank you Jane for loving her so much and caring so well for her. When Ingela rescued Pretty Boy in 2006, this is what she wrote "Pretty Boy makes you smile just to be around him. He just is so happy to be with people and wants to badly to please his people that he just gets into your heart. Between his big smile and his beautiful green eyes he is just a great impressive looking boy. " He was adopted by a young couple and promptly won their hearts. He became ill 2 years ago, and his owners did all that they could to help him. He is now over the Rainbow Bridge. after a good fight. 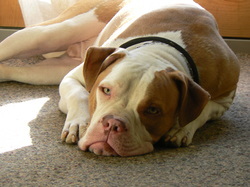 Good friend and companion Red passed over the Rainbow Bridge. Like Rudyard Kipling's cat he walked alone but loved and protected his owner and pack mate. Through his quiet presence and devotion, he won the affection of everyone who met him. After a life on the streets, his last years were spent being pampered and adored by his owner. scars to prove it. I adopted her from Rawhide Rescue soon after. was worth the wait. After a year and half they were so good together almost like having 1 dog. After a year I decided I needed to do more and took in a foster from Rawhide (Star Marie). great with her sleeping next to her at nights and sharing her beds with her. until Angel was gone because she had to help one more dog over the bridge. dogs have been saved and probably more to come..